Sunday June 1st, Ascension Day, witnessed the Ordination to the Diaconate of 15 men by Cardinal Sean Brady, Archbishop of Armagh. The Ordination took place in St. Patrick's College, Maynooth. Among the men ordained were Rev. Aidan McCann, a native of Cookstown, and Rev. Brian Slater from Coalisland. Revs. Aidan and Brian are pictured above. 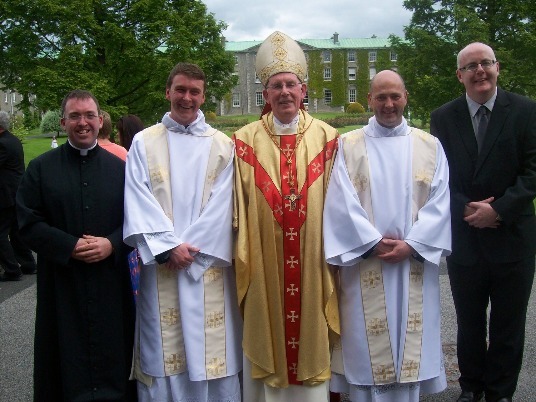 From left to right is Mr. Barry Matthews (Armagh seminarian), Rev. Aidan, His Eminence, Rev. Brian and Mr. Damien Quigley (Armagh seminarian). The Cardinal's homily from the Mass of Ordination can be found here: http://www.armagharchdiocese.org/2014/06/02/deacons-ordained-archdiocese-armagh/. Below is the photo of all of the newly ordained with the Cardinal and some of the formation team and deacons from St. Patrick's College, Maynooth. Back row (left-right) Rev Michael Geraghty (Killaloe Diocese), Rev Sean O'Donnell (Derry Diocese), Rev Brian Griffin (Ossory Diocese), Rev Aidan McCann (Armagh Archdiocese), Rev Eamon Roche (Cloyne Diocese), Rev Brendan Ward (Raphoe Diocese), Rev Chris Derwin (Dublin Archdiocese), Rev Vincent Stapleton (Cashel & Emly Archdiocese), Rev Paul Glennon (Dublin Archdiocese), Rev Shane O'Neill (Waterford & Lismore Diocese), Rev Ciaran Clarke (Meath Diocese), Rev Brian Slater (Armagh Archdiocese), Rev Robert McGivney (Meath Diocese). Formation), Rev Seamus O'Rourke (Ardagh & Clonmacnoise Diocese). Photo: Paul Keeling.